White trillium is the showiest of all trilliums worldwide and is highly prized in Europe and Japan. In springtime many forest floors are totally covered in trilliums. Most botanists believe that the trillium belongs to a separate family of plants called Trilliaceae. Its close relatives are the genus Paris and Trillidium, neither of which is native to North America. Trilliums are slow growers requiring minimum seven years from seed to flowering. Once a seed germinates, the first year’s focus is on the roots only. In its second year, the seedling will produce a single seed leaf. In the third year, the first true leaf will appear. Two or more additional years will be required before the plant produces the three-whorled leaves that we are familiar with. 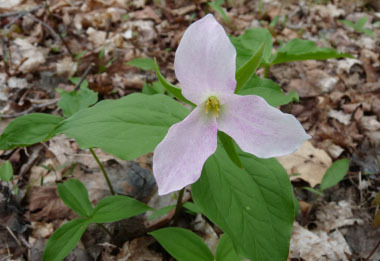 Distinguishing Features: The trillium is a spring ephemeral that is very easy to identify. This is a fair-sized plant that is easily distinguished by its white three-petalled flower that appear above a whorl of three leaves. White trillium is a perennial plant, arising from a single rootstalk. This rootstalk grows from a short rhizome containing long roots. Flowers: The white trillium flower has three white petals, elliptical shaped with pointed tips. As the plant matures, the petals turn pink. The flower is solitary and appears above the leaves. The flower stalk (peduncle) is 2 to 12 cm long. It has three green sepals. The petals are about 4 to 7.5 cm long. 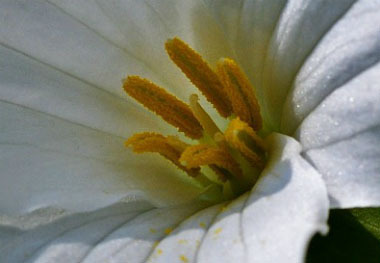 It has six stamens and a single pistil with an ovoid, greenish-white, 6-angled, superior ovary. Flowers bloom in May and early June. Fields of Nutrition has medicinal benefits and vitamin/mineral content of White Trillium. Leaves: A whorl of three sessile leaves appears at the top of the smooth, erect stem. Leaves are elliptic to broadly ovate, 12–20 cm (5 to 8”) long and 8–15 cm (3 to 6”) wide. They are glabrous, bases are tapering to rounded; apices are sharply pointed and the margins are entire. 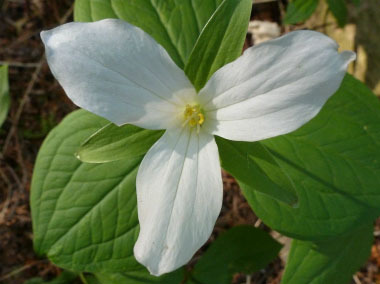 Height: This trillium grows anywhere from 20 to 50 cm (8 to 20”). 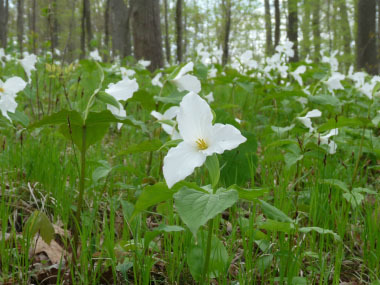 Habitat: White trillium typically grows in deciduous forests in Eastern North America. It has been seen in a couple of locations in western U.S. White trillium also grows in a few locations in Europe and Japan. It prefers rich soils in shaded locations with some sun. Trilliums also prefer dry to moderate air moisture. Edible parts: The leaves can be cooked and consumed. Due to the (approximate) seven year life cycle it is best to harvest only only leaf per plant. 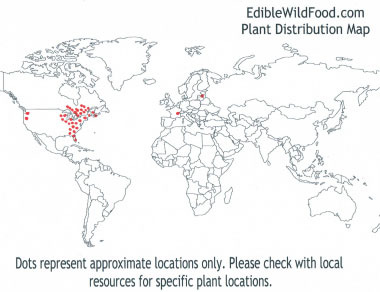 Check with your local laws as this plant may be protected. 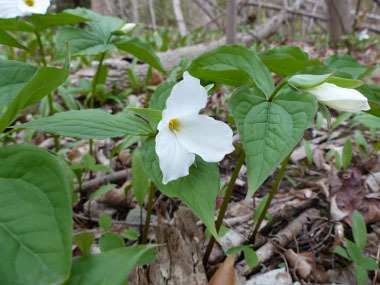 In the province of Ontario, trilliums are not to be picked if on conservation lands or in provincial parks. If the leaves as well as the flower are picked, the plant could die as it no longer has the ability to produce the energy it needs to take it through the winter into another spring. Similar plants: Red Trillium, Nodding Trillium.